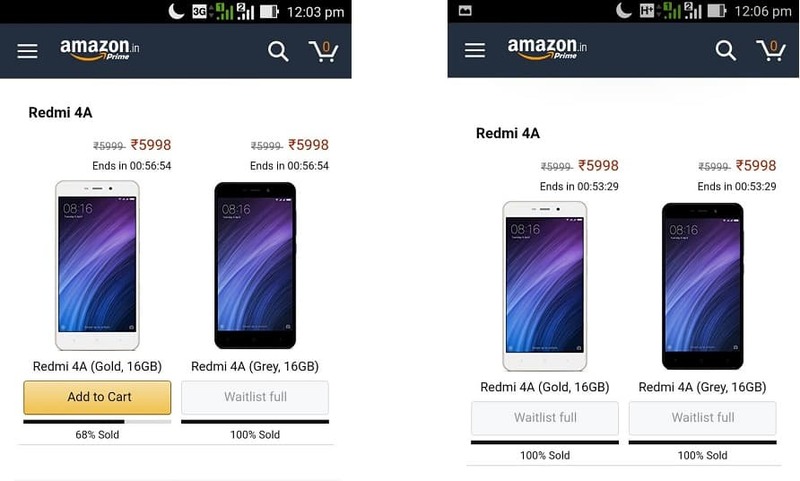 Amazon India, today, became the mecca of Xiaomi lovers as many of them logged in to buy the latest Redmi 4A smartphone. The sale began sharply at 12 P.M and what happened thereafter is something that we were completely surprised of. Within 6 minutes of time, both the color variants namely - Gold and Grey went out of stock as many even opted to enter the waitlist to completely saturate any available vacancy. Needless to say but if someone who had just logged in (at that moment) to experience the sale would have seen something like as shown in the following pictures. The above screenshots clearly depict and proves the never ending demand of Xiaomi smartphones in India. Redmi 4A has been recently launched in India and today was the first scheduled day of the sale of the smartphone. With an excellent 13 MP camera and smarter Snapdragon 425 processor, the smartphone attracted many to go for it at just Rs 5,499 and many will opt for it in the next sale scheduled to happen on March 30. Hence, Xiaomi Redmi 4A seems to turn out as another major hit after the Redmi Note 4 in India. Xiaomi devices have always ruled the Indian market and this time is also no different. After Redmi Note 4, this is another budget smartphone that packs everything at a very low price. For those who missed out this time, can log in to Amazon on 30th March 12 P.M for another try. However, with the past trends of Redmi devices, a fruitful suggestion will be to be on time as even more turnout of Xiaomi lovers is what we all expect on March 30.